Dr. Duxi Zhang, the President-Elect, announced the recipients of this year’s Young Chemist Award. Among the many highly qualified candidates, four outstanding high school students, Lingfeng Zhou from West Windsor Plainsboro High School South, Kenneth Pu from John P. Stevens High School, Erica Lai from Holmdel High School, and Monica Yang from Montgomery High School, were recognized for their outstanding academic achievements in chemistry-related disciplines. This annual award encourages interest in chemistry and science among high school students, and has been a popular program since its inception in 2003. The event provided entertainment as members and their families and friends performed songs and dances. The entertainment portion of the program included vocal performances by the well-known singer and now lifetime member Mingzhen Gu, a Mongolian dance by Wei Li (a member), two Chinese folk dances “The South of Rainbow” and “Pretty Actresses” by children of our members, a Spanish dance by Boya Xia, ballroom dancing by Tao Ying, and mini harmonica performances by George Chiu. Special gifts were also presented at the party to members who were the first to arrive at the party, who drove the longest distance to the party, who brought the youngest child to the party, and who has been a member the longest. 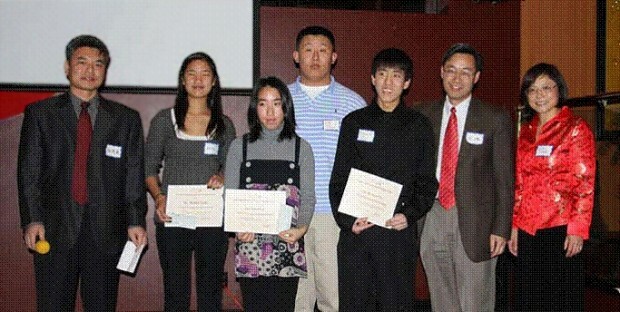 2009 Recipients of CACS Young Chemist Award with Tri-State CACS officers Duxi Zhang (president-elect), Monica Yang, Erica Lai, Lingfeng Zhou, Kenneth Pu, Longqin Hu (immediate past-president), and Sunny Wang (2009 president).